Our Strategy | New | Recruit | CHUGAI PHARMACEUTICAL CO., LTD.
To become a top Japanese pharmaceutical firm continually providing innovative new drugs. Here we introduce our strong points. Chugai Pharmaceutical's Japan-US-EU framework of cooperation with European pharmaceutical giant Roche and world-leading biomedicine developer Genentech in the US has enabled us enhance our pipeline, speed up our development times, and more. Our alliance with Roche earned high praise at the time from UK trade journals as a "new business model" for Japanese pharmaceutical firms. Under this business model, the two companies, strategic partners conducting their separate businesses independently, expand their business while functionally reinforcing and complementing one another. Now, having built a platform from which we can compete globally, Chugai Pharmaceutical delivers a continuous stream of innovative drugs as we strive to become Japan's top pharmaceutical firm. Since the 1980s, when most other domestic companies were not focusing on biomedicines, Chugai Pharmaceutical was engaged in the research and development of drugs using biotechnology. In fact the development of biomedicines requires new kinds of technology and knowhow. Chugai Pharmaceutical has established genetic engineering techniques and mastered advanced technologies such as antibody engineering, developmental engineering, and protein production technology, and conducted comprehensive genome antibody drug research and development. Now we have become known in Japan as a pioneer in biomedicines. One of our results has been the creation of Actemra, Japan's first antibody drug launched in 2005. A significant feature of the production field of biomedicines such as antibody drugs is how difficult it is to break into, since it requires the accumulation of advanced technologies and years of knowhow before a certain level of quality can be reached. Armed with our inherent technical strength, we will continue to launch the kind of innovative drugs that people want onto the market. Research LaboratoriesFuji Gotenba Research Laboratoriesis at the core of our biomedicine R&D network and where we conduct research into genome antibody drug creation, research into low molecular drugs (drug discovery in the fields of kidneys, metabolism, bones and joints, immunity, and others), developmental research into the special manufacture of existing commercialized products, and research on product fostering. Research LaboratoriesThis is where we conduct drug discovery research specializing in cancer and infectious disease (HCV), research to develop the attributes of existing drugs, and product fostering. Research LaboratoriesHere we examine the industrialization of newly developed drugs and produce study drugs. 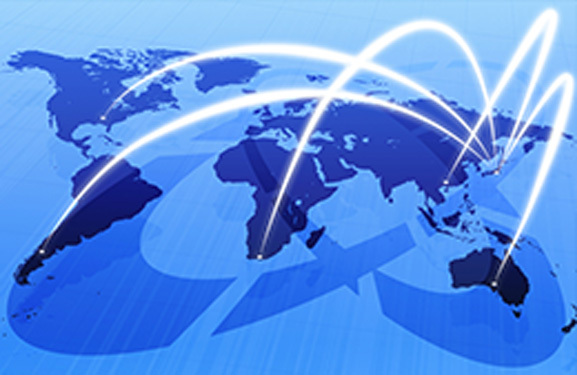 We are also strengthening our unique network by seeking applications in Japan and overseas, doing joint research with domestic and international universities and research institutions, participating in national projects, and conducting technical tie-ups and joint research with other companies. 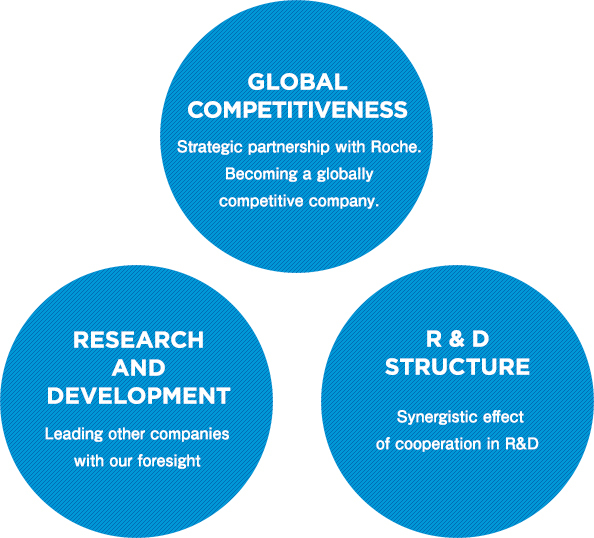 Taking advantage of the Roche Group network, we have built up a global R&D structure. We share information closely with Roche Group's research centers and Genentech, avoid duplication in R&D within the Group by sharing information about our R&D portfolios, and strategically implement joint research and the derivation and introduction of candidate development drugs. This system enables the early discovery of promising new drugs and the shortening of their development time. The system we have built facilitates the search for further innovation, conducting personnel exchanges and joint use of base technologies for drug discovery. 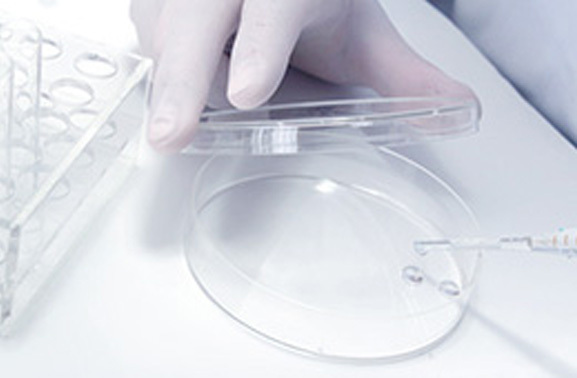 At Chugai Pharmaceutical, we have established satellite research bases with the aim of accelerating drug discovery and generating a continual stream of innovative R&D themes. Forerunner Pharma Research (Meguro-ku, Tokyo) is an interdisciplinary research institute that conducts molecular targeted drug discovery of treatments and diagnostic drugs for cancer and lifestyle diseases, and has located its research within the Komaba Open Laboratory connected to the Research Center for Advanced Science and Technology (RCAST). This environment provides a place to research mechanisms and incubate ideas about gene expression analysis data obtained from joint research with RCAST, as well as a place to conduct feasibility studies, enabling the quick and systematic analysis and evaluation of molecular target candidates. Chugai Pharmabody Research (Singapore) utilizes Chugai Pharmaceutical's unique new antibody drug discovery technologies for the purpose of quickly and efficiently finding candidate antibody drugs that could dramatically improve therapeutic efficacy. C&C Research Laboratories (South Korea) is performing targeted discovery research as well as drug discovery research centered on extremely flexible synthetic chemical function.